Fifty Shades Film: Three Members of Team Fifty Take the Ice Bucket Challenge! Who's Next? Three Members of Team Fifty Take the Ice Bucket Challenge! Who's Next? 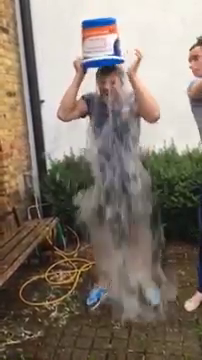 Jamie Dornan, Rita Ora & Victor Rasuk Accept the Ice Bucket Challenge! The cast of Fifty Shades of Grey is stepping up to the Ice Bucket Challenge. Yesterday we brought you the video of Jamie Dornan taking the challenge after his pal, Eddie Redmayne challenged him. Today we have videos of Rita Ora, who is plays the role of Mia Grey braving the ice water, and Victor Rasuk who took on the role of Jose Rodriguez. Rachel Skarsten, who filled the role of Andrea, tweeted that she will be taking the challenge as well. We will post the video as soon as we get it. We can't wait to see who will take the challenge next! Who do you think it will be?